Next weekend is Memorial Weekend. Mentally, that is where summer begins for me. 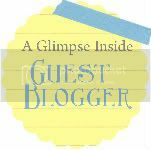 I am also over at A Glimpse Inside doing a guest post. Poor Allison is moving this month and everything is topsy turvey for her. I’m honored to help her out while she’s up to her eyeballs in cable installations and packing peanuts. Oh c’mon. You can clearly see how freakin cool this dude is. By the end of the summer we will all be wearing them that way.